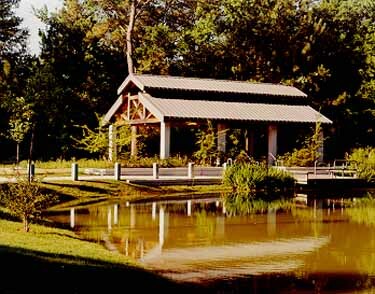 The Woodlands has commissioned six unique pavilions from us since 1987. Each is the centerpiece of an individual park in their extensive network of public spaces throughout the development. 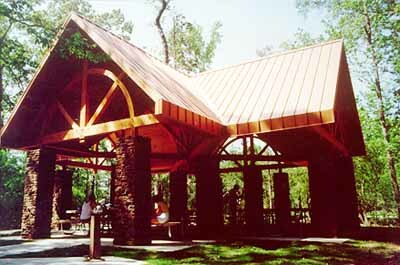 Two have received "Excellence in Wood Design Awards" from the Texas Forestry Association. All are open to the public. 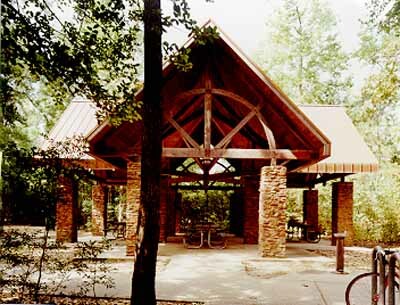 Visit The Woodlands Information Center for a map of the town. 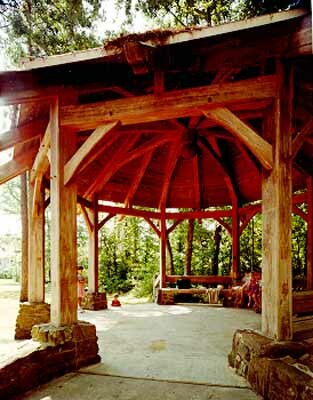 This octagonal structure is crafted from Cypress. The only exception is the eight sided boss pin in the center, which is recycled Southern Yellow Pine. In addition to the complexity of the octagonal shape itself, there are arched collar beams, built-in benches and rails, and extensive chamfers and other embellishments. 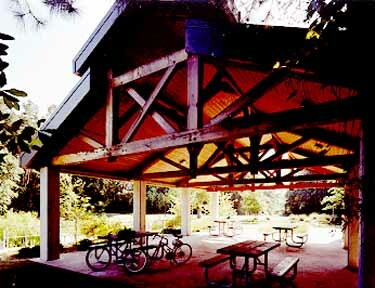 This community gathering pavilion is crafted from recycled Douglas Fir timbers salvaged from an old sawmill. This seemed appropriate given that a sawmill once stood on this site. The four queen post trusses were shipped assembled from our shop to the site. They were connected via heavily braced bay girts while still on the ground. The upper sets of rafters were then added so that the entire roof system was completed before it was lifted as one unit onto the textured concrete columns. This system of assembly saved much climbing on our part and was considerably safer than assembling the frame above the ground. 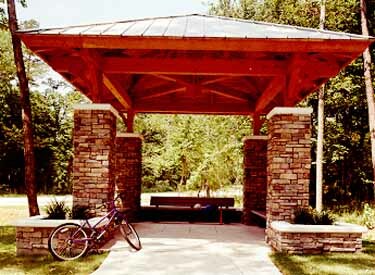 Just down the street and around the corner from the Lake Hills Park Pavilion, this diminutive shade structure echoes the architecture of its larger cousin. Again, kingpost trusses are enhanced by embedded arches. The frame is crafted from Douglas Fir. 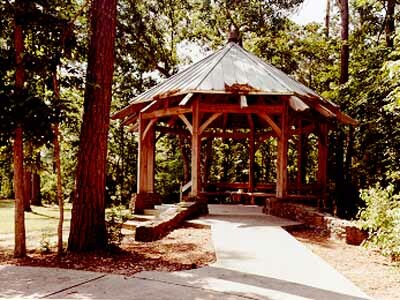 This was the first of the pavilions we have done for The Woodlands. 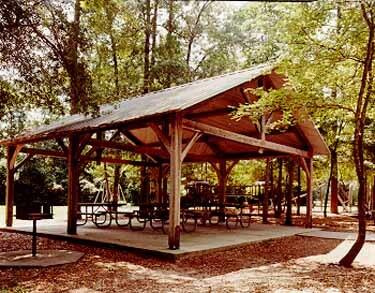 It is a very simple structure that features elegant and sturdy kingpost trusses. 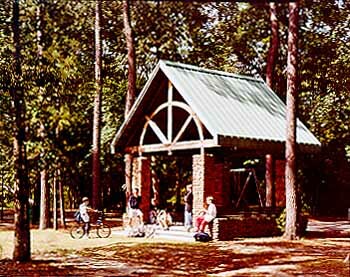 The frame was fabricated from Southern Red Oak in 1987. Done in the craftsman style, this timber frame roof structure features two kingpost trusses that share a common kingpost. 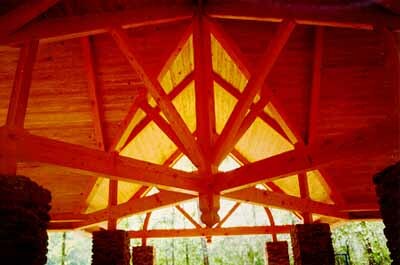 The upper chords (often mistakenly called rafters) of each truss form the four hips of the roof. 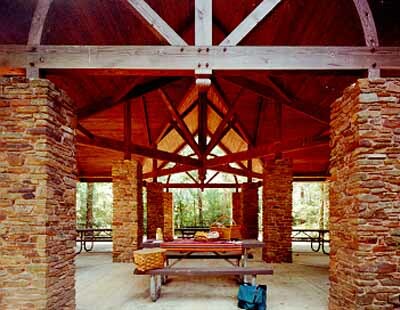 The horizontal layering or the timber work is reinforced by the stone work in the columns and benches. Again, we used recycled Douglas Fir for the frame.